2Doç. Dr., Ankara Eğitim ve Araştırma Hastanesi, Göz Hastalıkları, Ankara, Türkiye Purpose: To evaluate the prevalence and the conditions necessitating an Ahmed glaucoma valve (AGV) explantation. 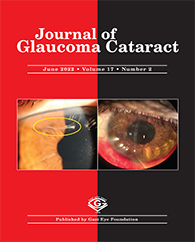 Material and Methods: This retrospective, noncomparative study includes the medical records of one eye of each 13 patients who underwent an AGV removal. Results: A total of 324 eyes received an AGV between April 2002 and March 2017 and 21(6.48%) of them had tube exposure. Eight eye of the 21 were successfully repaired by different methods but 13 of them underwent an implant explantation.For the 13 patients, average 2.2±0.4(2 or 3 times) repairing procedures were performed for each patient which include conjunctival pedicle fl aps or double layer amniotic membrane graft with/without pericardial patch graft but they required an explantation within 2 months after the last attempt because of recurrent tube erosion.The mean time with the AGV was 38.30±36.94(4-114)months.The mean intraocular pressure(IOP)value was 13±7(3-30)mmHg just before the explantation,and 26±1 (range;3-50) mmHg at the fi rst postoperative morning following the explantation without antiglaucomatous therapy. The mean follow-up period after the removal was 22±14(6-57) months.The mean IOP value was 22±10(5-42) mmHg with/without medical treatment at the last visit.